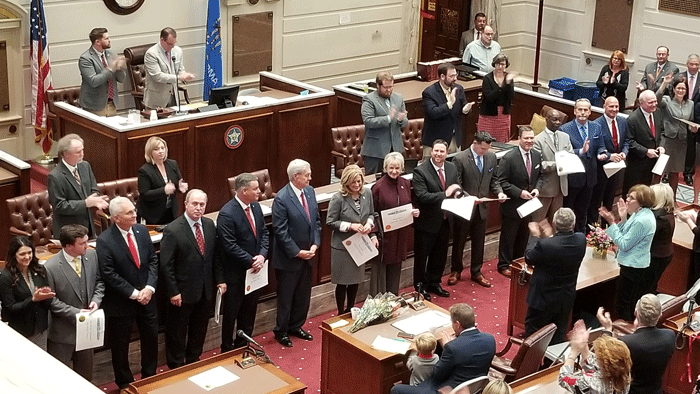 Twenty-four new and returning members of the Oklahoma State Senate were sworn into office at the Capitol Wednesday with Lt. Gov. Todd Lamb, President of the Senate, presiding over the ceremony. The oath was administered by the Honorable Douglas L. Combs, Chief Justice of the Supreme Court. New members taking the oath of office include David Bullard, R-Durant; Chuck Hall, R-Perry; Bill Coleman, R-Ponca City; Darrell Weaver, R-Moore; Mary Boren, D-Norman; Julia Kirt, D-Oklahoma City; John Michael Montgomery, R-Lawton; Carri Hicks, D-Oklahoma City; John Haste, R-Broken Arrow; Brenda Stanley, R-Oklahoma City; Brent Howard, R-Headrick; and George Young, D-Oklahoma City. Returning members include Senators Marty Quinn, R-Claremore; Mark Allen, R-Spiro; Roger Thompson, R-Okemah; James Leewright, R-Sapulpa; Frank Simpson, R-Springer; Stephanie Bice, R-Oklahoma City; Darcy Jech, R-Kingfisher; Michael Brooks, D-Oklahoma City; Kim David, R-Porter; J.J. Dossett, D-Owasso; Kay Floyd, D-Oklahoma City; and Jason Smalley, R-Stroud. The full Senate will officially convene for an organizational day on Tuesday, January 8, 2019, and the First Session of the 57th Legislature reconvenes on Monday, February 4. The deadline for requesting bills for the upcoming session is December 7. Those measures must be filed by January 17. The Senate website has streaming video from all committee rooms and the chamber. Legislation, the Senate Journal, biographical information on members, high resolution photos, committee and floor agendas, votes and press releases can also be accessed at www.oksenate.gov.